Eagle wide receiver Jordan Matthews during practice Monday at NovaCare Complex in s. Philadelphia. 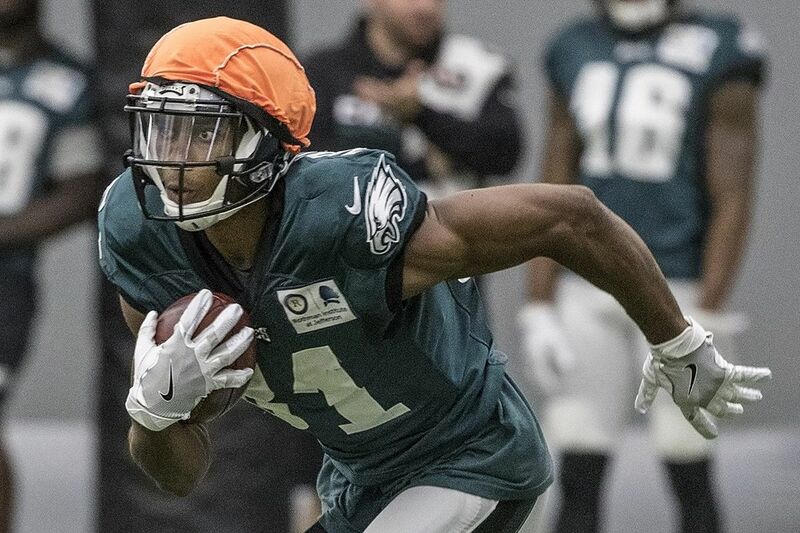 The speculation that Jordan Matthews will lose playing time at slot wide receiver to Nelson Agholor was not quieted by offensive coordinator Frank Reich, who said Monday that the plan at the position "is a little bit different than last year." "Every spot's up for competition," Reich said. "The way we roll things, we're always looking for guys who make plays. Nelson's had a real strong spring and camp, so the way we do it is kind of by play. Sometimes we'll switch guys up." The question was whether Matthews is still the team's slot wide receiver or if he faces competition. Reich brought up Agholor's name without prompting. Matthews has been the team's top wide receiver the past two seasons and the slot receiver since 2014, when he first arrived in Philadelphia. When asked if Matthews will keep the same role he had last year, Reich suggested it could change. "Right now, the whole receiver room is more competitive," Reich said. "So yeah, I think it is a little bit different than last year." The subtext is that Matthews is entering the final year of his rookie contract and is a free agent at the end of the year. Agholor, who has two years left on his deal, has stood out this offseason. NFL Network analyst Daniel Jeremiah, a former Eagles scout who visited camp this summer, said that he expects Agholor to be the slot receiver and does not know where that would leave Matthews. Matthews was critical of that suggestion. Although the Eagles experimented with Matthews as an outside receiver last year, he's been in the slot. Plus, the Eagles signed Alshon Jeffery and Torrey Smith this offseason. Most of Agholor's work while underachieving in his first two seasons came on the outside, so he figured to lose playing time when the Eagles added Jeffery and Smith. But it now appears Matthews could be affected. "Jordan can play outside. We can be in four receivers and have two slots," Reich said when asked how Matthews could be used when Agholor plays the slot. "We don't want to take our tight ends off the field too much, but we have a bunch of different personnel packages. And we'll just continue to mix them up week by week." Reich was effusive in his praise of Agholor. He said that Agholor has "gotten over the hump" and is "making a ton of plays out there." He called Agholor a "threat." Still, Agholor has had limited production since entering the NFL. Matthews has averaged 75 catches, 891 yards, and six touchdowns in his three NFL seasons. He's been a reliable, productive player on a team that has had problems around him at the position. So how did his career arc go from the team's No. 1 wide receiver to potentially losing playing time to a player who has been far less productive? "I don't know how it's going to play out," Reich said. "Is it going to be a reduced role? Is it not? I think that's to be determined. That's going to be determined … by how he plays and how things play out in that room competitively. Last year, Jordan and Carson [Wentz] were almost like Zach [Ertz] and Carson at the end of the year. We know there's something there between those two guys. So we'll look to develop that and certainly expect big plays out of Jordan."